Hi guys! Today's post is going to be short and sweet. I did these Halloween nails last year and I really loved them. I attempted to recreate them this week but I've been feeling pretty meh and didn't manage to do what I planned. In any case, these nails look good to me and hopefully to you too. I also did candy corn nails last year. I will show you that in another post later on. Anyway, that's it from me today. Sorry for the super short post. I've been working on quite a few things and I haven't exactly been inspired to do nails. If you're thinking, aww I wish you posted more often, fear not. You can always hop over to my main site that I share with my sister and check it out. 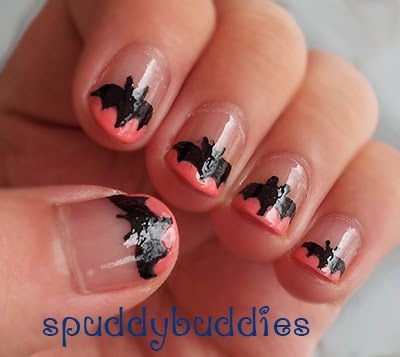 What Halloween nail art are you attempting this year? Is Halloween nail art your thing or do you not care for seasonal nails? What do you think of my pink bat french tip nail art? Hi, your nails are perfect and you did a great job! 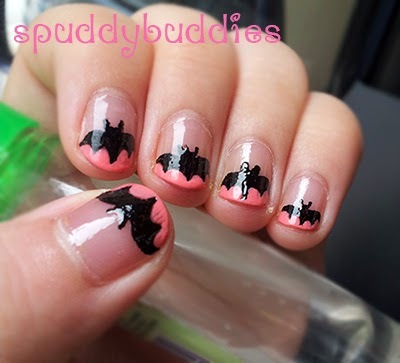 These are so cute - I've never seen a bat French tip before! Me neither! Until one day I Googled for Halloween nails (how original, I know, haha) and was pleasantly surprised by how cute they looked! Those are cute, love love love them for the season! I love it!! Your design is too cute!! Thanks a lot. It means a lot to me that you like it. Your nail art is amazing! Such a cool idea for Halloween! I love these - absolutely adorable! My daughter and I are going to be sportin' these for sure! LOVE. That is just awesome!